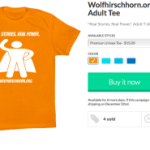 April 16 is Wolf-Hirschhorn Syndrome Awareness Day. What will you do to spread the word and increase understanding among those in your sphere? Thank you all for your support of and contributions to this community. And for all that you do for your amazing kids!